Having crooked teeth is nothing to frown about. That is why Invisalign is a great way to straighten your teeth without the worry. Invisalign is also a great alternative to metal braces that will provide a fast and effective way to correct your teeth without the hassle of conventional braces. Invisalign technology is so advanced that with the use of a computer program, a series of aligners will be made and a customized treatment plan is created for you. This technology uses 3-D imaging to make each tray an exact fit during each stage of treatment. When you receive your custom aligners, your dentist will set up a treatment plan and care for you with a monthly examination. All you do is simply wear your Invisalign throughout the day and only remove them to eat and when you brush and floss. With each new tray you will notice the gradual movement of your teeth as they begin to shift into their correct alignment. You will be able to see how much closer you are to getting to that perfect smile you have always wanted. Make an appointment with your dentist to see if you are a candidate for Invisalign. For more information visit the Invisalign website. Dental Implants – What are they and who needs them? Dental implants were created to replace both the lost natural tooth and its damaged roots. 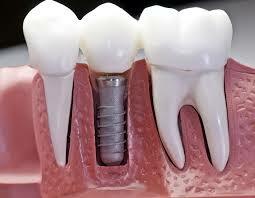 With dental implants, you are able to fix and replace missing teeth. Implants can provide a permanent replacement so you can restore confidence back into your smile, and also regain the ability to chew your food and speak naturally. Implants have greatly improved and can last for a lifetime and preserve the health of the adjacent teeth. It prevents bone loss and preserves facial appearance. Dental implants are the most recommended and best solution to missing teeth as they will restore the natural presence of your mouth. Depending on your situation, dental implants can restore full functionality of your mouth. Implants look natural and will improve your oral health. Talk with your dentist for a detailed evaluation to see if dental implants are right for you. For more great information visit the Academy of Osseointegration’s website. There have some great graphics and explanations. https://www.canyondentalcare.com/wp-content/uploads/2014/11/implants.jpg 198 255 Staff Canyon Dental https://www.canyondentalcare.com/wp-content/uploads/2018/05/Canyon-Dental-New-Logo-trans-3-e1526588705132.png Staff Canyon Dental2014-11-13 13:19:432014-11-13 13:19:43Dental Implants - What are they and who needs them?